York County is unique in the South Carolina upstate because of its active encouragement of heritage preservation and its support for historical research. One of the entities making up the Culture & Heritage Museums, the Historical Center of York County was opened in 1989 to serve as the County's archival repository, and to collect, preserve, interpret, and maintain information of historical importance. We strive to encourage scholarly study of primary documents and to educate the community about the value of its historical heritage. The sources for collections of personal, organizational, and family papers vary. Most often, individuals keep family papers, photographs, and memorabilia. 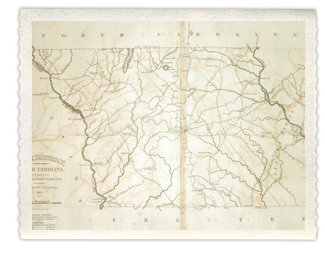 Because of their historical interest and value, letters, diaries, scrapbooks or other material documenting the lives and activities of families and organizations in the Carolina Piedmont make valuable additions to our collections. Our archival holdings are primarily records donated by the public. If you have treasured items that help document this region’s history you may want to consider placing them in our care. For more information, contact the archivist at 803.684.3948, ext. 32. In 1991, Historical Center staff conducted a county-wide survey of historic properties. The survey, listing over 1,200 sites and structures, was condensed into a staff publication, Historic Properties of York County. This publication is available for research at the Historical Center. In 1993, the Historical Center sponsored Heritagefest, an event featuring family information booths, a lecture series, workshops and entertainment. The Confederation of South Carolina Local Historical Societies held its annual Landmark Conference in York in 1994, with the Historical Center as one of the hosts; and staff members have served, and continue to serve, on that organization's board. In 2002, Historical Center staff were pivotal in bringing to York County the Fourteenth Ulster-American Heritage Symposium, a biennial meeting that encourages scholarly study and public awareness of the historical connection between Ulster and North America, including what is commonly called the Scotch-Irish or Ulster-Scots heritage. More recently, the staff have worked closely with York County Planning and Development Services to identify and register abandoned cemeteries and historic sites in York County. They have worked with area churches to set up church archives; with teachers for curriculum development; with municipalities regarding identification and preservation of historic districts and structures; and conducted outreach programs for teachers and school children. Staff members have also appeared on South Carolina Educational Television. The Historical Center has advanced the cause of scholarship in the Carolina Piedmont through research and publishing. The Historical Center has studied such topics as occupations, architecture, brick bonding patterns, tombstone art, decorative arts, and early Scotch-Irish settlement. In 1996, the Confederation of South Carolina Local Historical Societies awarded the Center its annual "Outstanding Publications" award for the books, "Making Money: Early Occupations in York County" and "Under the Leaves of the Palmetto: York County's Confederate Veterans" (2 volumes). All these efforts help forward knowledge of the Piedmont region, and establish the Center's reputation as a leader in disseminating historical information. Despite these activities, the Center is probably better known in Dallas, Texas and Salt Lake City, Utah than in its own county. Over the years the Historical Center has seen researchers from every state and six foreign countries (Canada, England, Germany, Ireland, Japan, and Liberia). Professors and students from a number of major universities--including Clemson University; Duke University; Harvard; Okinawa University; the University of North Carolina at Chapel Hill; the University of South Carolina; the University of Ulster; the University of Virginia; and Yale--have utilized the facility.